Is cycling getting more dangerous? After cycling champion Bradley Wiggins and British cycling head coach Shane Sutton were caught up in collisions with cars within hours of each other, how sure can cyclists be that they are safe on Britain's roads? And what can they do to protect themselves? Just hours apart, two high-profile cyclists experienced first hand the dangerous side of the sport they love. Reports came in on Wednesday night that Bradley Wiggins, the Olympic gold medallist and Tour de France winner, had been involved in a crash near a petrol station near Wigan, Lancashire. He suffered bruising. 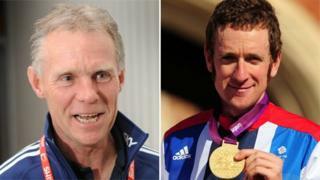 And on Thursday came the news that Shane Sutton, the GB cycling head coach, had bleeding on the brain after a bike crash in the Manchester suburb of Levenshulme. He is still in hospital. BBC sports news correspondent Dan Roan says it is "astonishing" that the pair suffered the same fate in separate incidents within hours of each other. And cycling fans agree - many have taken to Twitter in the past 24 hours to describe their shock that two cyclists at the top of their game could be left in hospital. Although this was undoubtedly an unfortunate coincidence, the incidents suggest that even the most experienced cyclists are not immune to the dangers of Britain's roads. But just how dangerous is cycling? And is it becoming less safe? John Meudell, South East representative for CTC, the national cycling charity, says: "Cycling has become more dangerous because of the number of vehicles on the road - it has become more intimidating because motorists give you less and less room. "One thing it isn't these days is pleasant." Nigel Barclay, 45, from Banstead, Surrey, suffered life-threatening injuries when he was knocked off his bike by a car in March this year. "I sustained two broken legs, my pelvis was broken in two places, my arm was broken, my elbow was smashed and I had multiple skull fractures," he says. Mr Barclay suffered brain damage and is now deaf in one ear and partially sighted in one eye. "I spent 12 days on life support. They were saying to my wife that they didn't know if I would survive or not," he says. The teenage driver's punishment was four points on his licence, and Mr Barclay says the magistrates "let us down horrendously". He adds: "The message it puts out is that it's OK to knock a cyclist off." Figures from the Department for Transport (DfT) show that last year 107 cyclists were killed on British roads. In 2010, that figure was 111. It is likely most were male, the DfT says. But since 2004, the figures show a gradual decline in the number of fatalities, which would suggest that the roads are becoming a safer place for those on two wheels. However, a look at the figures for deaths and injuries combined paints a slightly different picture. Although that figure hovered at about 16,000 between 2004 and 2008, since then it has steadily risen. Last year it was 19,215 - 2,030 more than in 2010. And, according to figures collated by the Times - which has run a high-profile cycle safety campaign since one of its reporters was hit by a lorry and left in a coma - 104 cyclists have been killed so far this year. It is a figure the DfT cannot confirm but the newspaper says that this year's death toll looks set to overtake last year's. Mr Meudell, who lives in Dorking, Surrey, and has been cycling for 50 years, says he believes a lack of interest "at all levels of government" has caused the roads to become increasingly dangerous. "It is complacency on the part of the highways establishment," he says. "Despite all the statements that they are improving, they are doing the opposite. The only way we are going to have progress is to have an independent inspectorate of roads like they have in America." Roger Geffen, campaigns and policies director at the same charity, is concerned about a different type of complacency - among drivers. "We see this sort of attitude that when drivers hit cyclists or indeed pedestrians... that it's just somehow an accident, it's somehow carelessness," he says. "The legal system doesn't adequately respond. I know so many cases - whether it's eight-year-olds, 80-year-olds, champions, children, whatever - cyclists of all ages and backgrounds and all levels of skill, being hit by drivers who then sort of say, 'Sorry mate, I didn't see you'." He says the courts treat it as such and drivers "get slapped wrists". "We shouldn't be accepting that sort of attitude," he says. However, cyclists can also be to blame, sometimes by breaking the law. The Institute of Advanced Motorists found that 57% of cyclists had jumped a red light at least once, with 14% doing it regularly or sometimes, in an online poll of 1,600 people earlier this year. It found the main reason given was because it was safer to get ahead of other traffic but more than half of those polled (54%) also felt cyclists needed to improve their behaviour. Brian MacDowall, spokesman for the Association of British Drivers, says safety depends on respect and responsibility on the part of all road users. "Putting blame on one type of road user will not help make the roads safer," says Mr MacDowall, himself an avid cycling fan. Former British cyclist Michael Hutchinson, now a journalist at Cycling Weekly, highlights a different approach. "There have been suggestions that perhaps the driving test could include not only more instruction on cyclists but perhaps even a cycling module where new drivers have to pass a cycling test before they're allowed to drive a car," he says. According to CTC, the national cycling charity, which quotes figures from the 2001 census, 43% of the population own or have access to a bicycle, while about 750,000 use a bike to get to work. However, these figures are no doubt much higher now. Kaya Burgess, who is leading the Times's Cities Fit for Cycling campaign, is in no doubt that much more needs to be done to keep cyclists safe. "It's awful that it takes such high-profile accidents for cycling safety to be so high up the agenda, but what we are calling for is that the roads in Britain just need to be improved for cyclists," he says. He says that until this happens we will only see more incidents. Road Safety Minister Stephen Hammond says cycle safety is "very much at the heart of transport policy". "The government is fully committed to encouraging cycling and improving safety and recently launched the first THINK! cyclist campaign," he says. "We have also invested £30m to tackle dangerous junctions for cyclists and are giving more than £1bn to councils to design solutions appropriate to their local transport challenges, including improving their road infrastructure to encourage cycling. "We have also made it simpler for councils to put in place 20mph limits and install mirrors to improve the visibility of cyclists at junctions. We will continue to work with our partners, including British Cycling, to do everything possible to encourage cycling and improve safety." Is dangerous cycling a problem?